SBI Life Smart scholar policy is mainly used for the children.When your child takes baby steps towards you, nothing seems more blissful.With this divine happiness comes a new sense of responsibility that’s close to your heart. You want to make your child’s life a bed of roses . For that to fulfill your needs, SBI Life provide you with a flexible and all-encompassing solution: SBI Life Smart Scholar policy, a non participating Unit Linked Insurance Plan which Secures your children future by gaining from the financial markets. And its gives a protection to your child in your absence. • Company will pay a lump sum benefit equal to maximum of Sum Assured and 105% of all basic premiums paid as on the date of intimation of death claim. If on the date of intimation of death, the Sum Assured is less than 105% of all premiums paid, the amount in excess of the Sum Assured will be paid from your Fund by dis investment of units. • Company would continue to pay your future premium(s) on your behalf (inbuilt Premium Payor Waiver Benefit) and the accumulated Fund Value will be paid at maturity. During the term of the policy loyalty units would be given for in-force policies on completion of specific durations. Loyalty additions depend on term of the policy. The loyalty addition at relevant Policy Year end will be equivalent to – 1% x [Average Fund Value over the 1 day of the last 24 policy months]. For more information regarding Tax Benefits, visit www.taxqueries.in. In addition, Accident Benefit which includes Accidental Death benefit and Accidental Total and Permanent Disability (Accidental TPD) benefit, is an integral part of the plan. In the event of unfortunate death of life assured, a lump sum benefit equal to higher of the Sum Assured. If on the date of death, the Sum Assured is less than 105% of all premiums paid, the amount in excess of the Sum Assured will be paid from your fund by dis investment of units. In the event of death of child no Sum Assured is payable. Life Assured will inform the company regarding the event. In such case he can either continue the policy or terminate the contract. In case of termination of contract, the fund value will be payable. On completion of the policy term, Maturity benefit = The fund value shall be paid to beneficiary in a lump sum or as per settlement option, If chosen. The policyholder if he/she survives (or) child, in case of death of the Life Assured during the policy term. The Accident Sum Assured is equal to the base sum assured, This Accident Benefit shall be payable only once, i.e. in the event of death or disability whichever occurs first. Monthly Charges = Accident Sum Assured x (Annual rate/12),where the Annual rate is Rs.0.50 per 1000 Accident Sum Assured. In case of death of child the premium payor waiver benefit will cease and no further charge will be deducted. Sbi life smart scholar has several types of funds like Index fund, Equity fund, Top 300 fund, Equity optimizer fund, P/E Managed fund, Growth fund, Balanced fund, Bond fund, Money market fund etc. for more information about funds you can get in brochure. The objective of this fund is to provide high equity exposure targeting higher returns in the long-term. The objective of this fund is to provide accumulation of income through investment in both equities and fixed income securities with an attempt to maintain a suitable balance between return and safety. The NAV Computation under sbi life smart scholar the unit price shall be computed on whether the company is purchasing or selling assets in oder to meet the day-to-day transactions of unit allocations and unit redemption. (Market value of investments held by the Fund + Expenses incurred in the purchase of assets + Accrued income net of fund management charges+value of any current assets-value of any current liabilities-provisions)/Number of units existing at the valuation date. (Market value of investments held by the fund-Expenses incurred in the sale of assets+accrued income net of fund management charges+Value of any current assets-Value of any current liabilities-Value of any current liabilities-provisions)/Numbers of units existing at the valuation date. You can calculate your premium with premium calculator, premium calculator will be embedded soon. SBI Life Smart scholar policy has an online payment options means you can buy your policy . 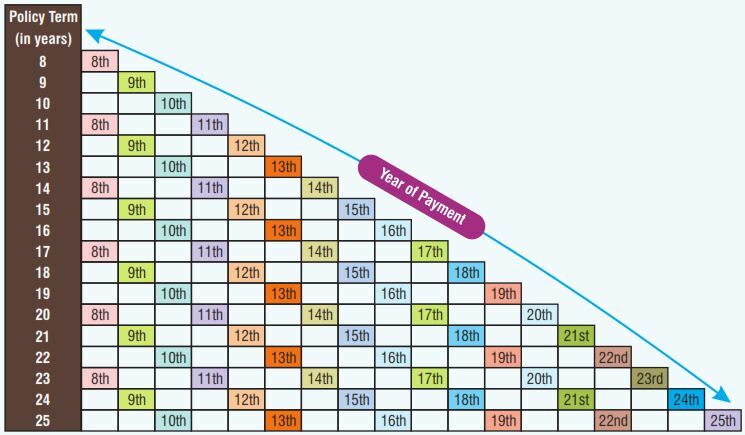 A grace period of 30 days will be allowed for Yearly, Half-yearly & Quarterly premium payment frequencies and a grace.period of 15 days will be allowed where premiums are paid monthly. you have the option to return the policy stating the reasons. You can surrender your policy at any time during the Policy Term.If the surrender is requested any time after completion of 5 Policy Year, then the Fund Value will be paid immediately. 1.What is meant by policy administration charges? A monthly Policy administration charge of Rs. 50 per month shall be deducted by cancelling units at the prevailing unit price on the first business day of each policy month. Mortality charges are deducted on the first business day of each policy month from Fund Value by way of cancellation of units. Mortality charges will be based on your age and Sum Assured.